Get out and about and socialise! Regular walking will help you feel good, reduce your blood pressure, reduce your stress levels, keep your heart strong, improve your sleep patterns and help to manage your weight. You will feel an increase in your energy levels and much happier due to the realease of endorphins (‘Happy hormones’). Adults should aim to be active daily. Over a week, activity should add up to at least 150 mins (2 ½ hours) of moderate intense physical activity, in bouts of 10 mins or more – or 30 mins every day! We would like to invite to come along and join in a walk …. whether it is for a short, 30 minute brisk walk, or a longer 2 hour saunter, there are plenty to choose from. Whatever your ability, or whatever takes your fancy, there’s a walk to suit your needs. Walk your way to fitness in the company of others whilst enjoying the beautiful surroundings North Tyneside has to offer. A weekly walk 10.30am – 11.30am (meet 10.15am). Meeting point: The Parks Sports Centre Reception Area, North Shields. 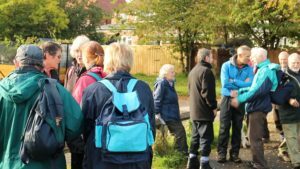 A fortnightly walk 10.30am – 1:00pm (meet 10.15am). Meeting point: Churchill Playing Fields or Rendevous Cafe, Whitley Bay. 1st and 3rd Tuesday of every month 10.00am – 11.30am (meet 9.45am) . Meeting point: White Swan Centre, Killingworth. 10.30am – 2:00pm (meet 10.15am). Meeting points vary; please call for details Contact: Ron Cave on 0191 2809453 / 07913509396. 10.45am – 11.45am (meet 10.15am). Meeting point: Reception Area at Hadrian Leisure Centre, Wallsend. Contact: James on 0191 643 2025. Walk Leaders Carl and Stephen. A weekly walk 12noon – 1.00pm (meet 11.45am) . Gentle walk suitable for those with mobility issues. Meeting point: St Aiden’s Church Hall Billy Mill Lane North Shields. Contact: Don Slater on 0191 258 4352. 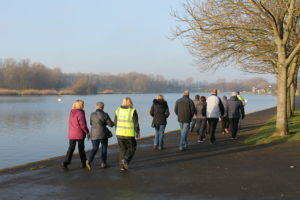 A weekly walk 10.00 – 11.00am (meet 9:45) Meeting point: Lakeside Centre, Killingworth. Contact: Carol on 0191 6434177. A weekly walk 10.30 – 12.00noon (meet 10.15am). Meeting point: Prior’s Haven car park Tynemouth. For further information; contact: Viki Mayes on 0191 252 9901. A weekly walk 10.00am – 11.00am (meet 9.45am). Meeting point: Waves cafe area. The Links, Whitley Bay. Contact: Andrew or Lee on 0191 643 2600. A weekly walk 10.30am – 11.30am (meet 10.15am). Meeting point: The Parks Sports Centre (reception) Howdon Road North Shields. Contact: Mark Thompson 0191 643 2700. 10.30am – 11.30am weekly. (Meet 10.15am). Meeting point: Just inside visitors centre. Contact: Carl on 0191 2623102. If you are interested in any of the walks listed above please call the contact person for that particular walk. Are you living with Cancer? Or caring for someone that is? Why not come along to our weekly ‘Walk and Talk’ group, meet other people, share experiences and enjoy the fresh air. All walks finish at a cafe afterwards for refreshments. Booking is required. Monday afternoons at 1.00 – 3.00pm (various locations around North Tyneside). For more information and to book a place please contact Macmillan Support Services and speak to Angela or Helen on 0191 293 4377 / 07786595953. Alternatively you might prefer to follow one of our self led walks. Click HERE for your pack of 17 routes throughout North Tyneside ranging from 1 – 7 miles. For any further information please contact Gillian Adam – Physical Activity Co-ordinator for Adults on 0191 643 7441.